With more than 100 “Occupy Wall Street” protestors arrested Tuesday in Boston and dozens more in Chicago and Washington, the American anti-bank movement is anticipating a global presence Saturday. 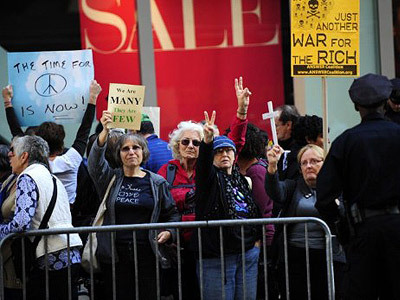 ­On Wednesday four people were arrested during the latest "Occupy WallStreet" protest in front of the Manhattan headquarters of JPMorgan Chase Bank. 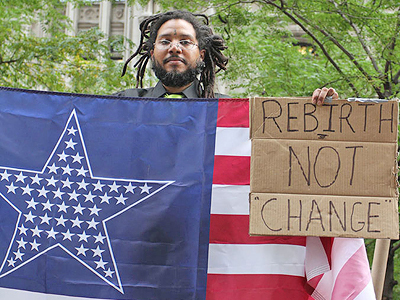 The demonstrators say they wanted to deliver a message to the bank's CEO, Jamie Dimon. Several protesters brought oversized bank checks made out in the amount of $5 billion, the Associated Press reported. According to the organizers, this was to symbolize what Dimon and other members of New York's financial elite are expected to save when the current income tax on millionaires expires on December 31. The tax rally in New York started on Tuesday, when the protesters staged demonstrations in front of Dimon's house, as well as the houses of four other wealthy residents of New York. 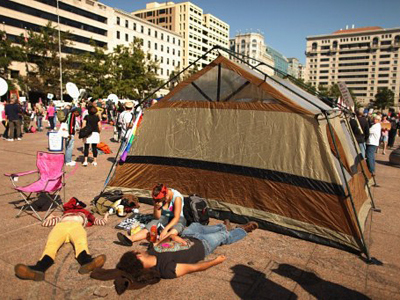 In Boston, where “Occupy Wall Street” supporters have been camping out in downtown Dewey Square since September 30, police arrested 141 demonstrators in the wee hours of Tuesday morning. The official spot for “Occupy Boston” soon became overcrowded. Protest organizers made an informal arrangement to spread out to the nearby Rose Kennedy Greenway – a fact which was confirmed by the area’s management on their website. Still, when some of campers started to move out to the greenway, police began making arrests. The police crackdown was later defended by Boston Mayor Thomas Menino, who nevertheless told the protesters he shared their views. "I understand they have freedom of speech and freedom of expression, but we have a city to manage," said Menino, according to Boston.com. "I'm open to suggestions, but civil disobedience will not be tolerated." 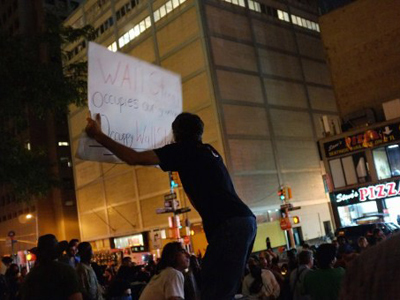 But such episodes only seem to strengthen the resolve of the “Occupy Wall Street” movement. Back in New York’s lower Manhattan, where the demonstrations originated almost a month ago, the protesters say they are as committed to go on with their rally as before. Police officers will now and again walk through the camp in Zuccotti Park ripping down anything hanging on the trees – signs, posters or personal belongings. Many “Occupy Wall Street” protesters fear this might be a provocation, but they are determined to keep their demonstration peaceful, RT’s Maria Portnaya reported. Thousands across America rallying against corporate greed and Wall Street bank bailouts have inspired thousands more around the world. An “International Day of Action against Banks” will be held in at least 260 cities across the world, from London to Las Vegas, the organizers told RT. In London, the so-called “Occupy London Stock Exchange” group said a Facebook page on the protest had attracted more than 9,000 followers, with more than 3,500 confirmed attendees. "Yet bankers continue to make billions in profit and pay themselves enormous bonuses, even after we bailed them out with 850 billion pounds," she added. The campaign in London unites various organizations, including the direct-action group UK Uncut. Their aim is to promote a "global movement for real democracy" while highlighting social and economic injustice.